The outer covers of 1962 and 1963 are almost identical. The 1962 printing says at the top "A Penguin Crime", but the 1963 is "A Penguin Maigret." The lettering in 1963 is slightly bolder, and the book number at the base of the spine has a "C" added above the "1680". The back cover text is the same, but in the 1963 printing "This astonishing writer..." starts on a new line. The inside front covers have the same text, a biographical paragraph, but different photos of Simenon. 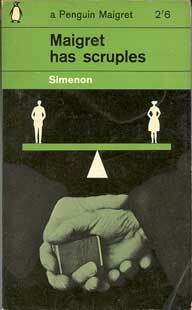 The inside back covers are both lists of Simenon Penguins, but the 1963 edition is longer.